Well i revised my own topic. Gonna edit more in the future. 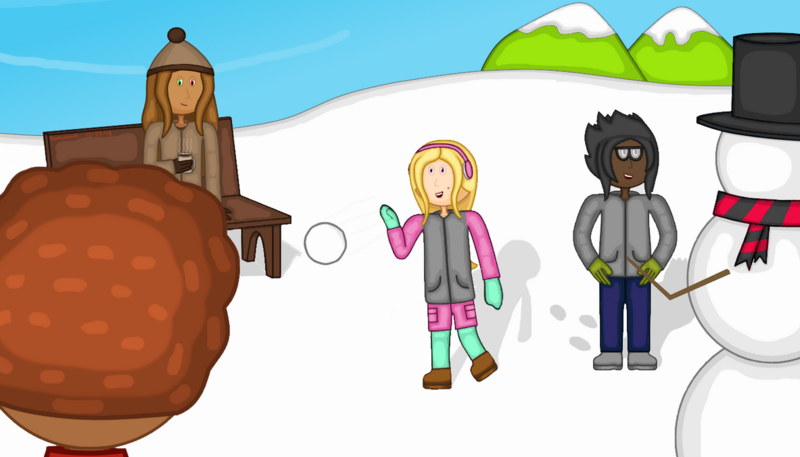 They are the main fan characters of OcFanatic. They called themselves the Foodie Crew based on their favorite restaurants. They all have interesting friendships, personalities, skills, and many more. They are also Jester X Game's favorite competitors. They all from Munchmore who are different food. Some are good guys like the Munchmore Freedom Gang and some are bad guys like the members of Radley's army. They are the mysterious ones with different backgrounds. Rather human, ally, enemy, or other beings. They are mysterious. They are family of X from X-world. They all have different types. First is the X Heroes who are from X-World, while next is the X Games who are the bad guys and force people to play to their games in both Flipverse and Munchmore with a sub-group "The Four Decks of X-Games" who are hybrids and from the future. The only X Game who isn't a bad and isn't forceful is Harlequin X Game. Though, both types don't know eachother and they were separate. 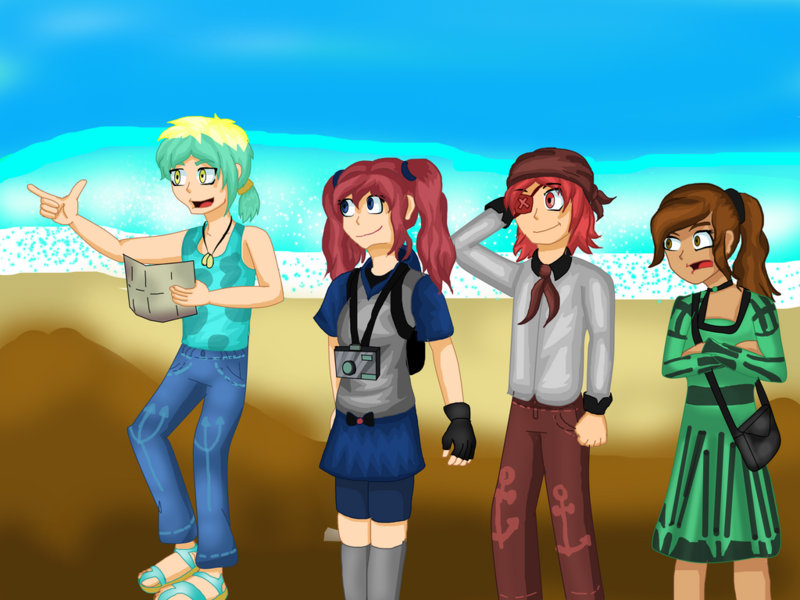 The normal type of fan characters. Some are the relatives of the Foodie Crew. Sundae was once a shy and fearful little girl, her brothers asked her to overcome her fear of water by swimming but a storm came and got her disappeared for 4 years. She was found at the age of 8, but she became a brave and happy young kid. She's now brave enough to do something and a social butterfly but her brothers started being overprotective due to their fault's on her disappearance. This made her getting annoyed about being overprotective and sometimes go somewhere without them knowing. She is Calypso Island's favorite summer girl and she sometimes help people to have a enjoyable day in Calypso Island. -The reason she hates pants is because it's really uncomfortable. 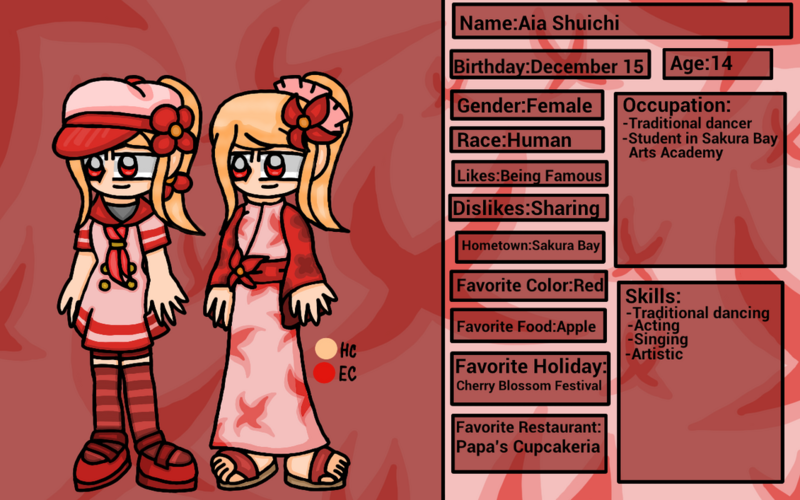 -Her birthday is the day Strawberry Sundae's day celebrated. -She wore a diving suit when swimming or surfing. He is the son of the head of the secret spy organization. 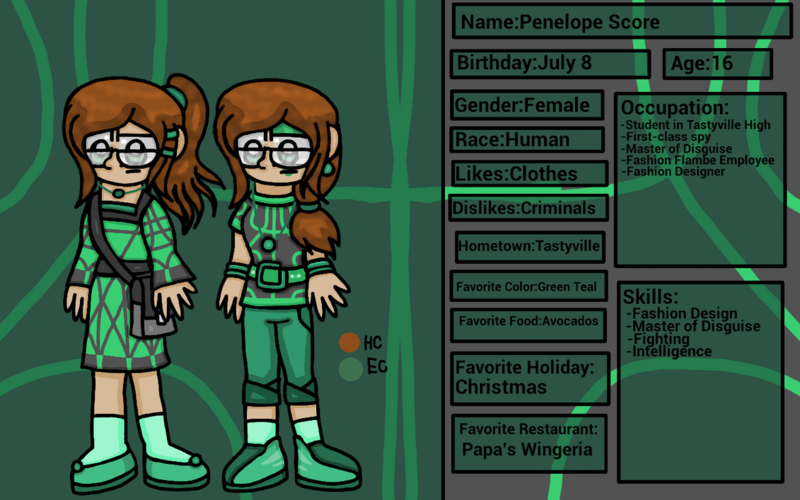 He and her older sister, Penelope Score, are first-class spies despite their age but they don't really get along ever-since he was 4 when Doug invited a stranger to the organization without knowing that he is an enemy and attack the organization and killed his father which Penelope blame him for it. He and Penelope were sent to Tastyville to gather information about Papa's customers due to many incidents related to that. 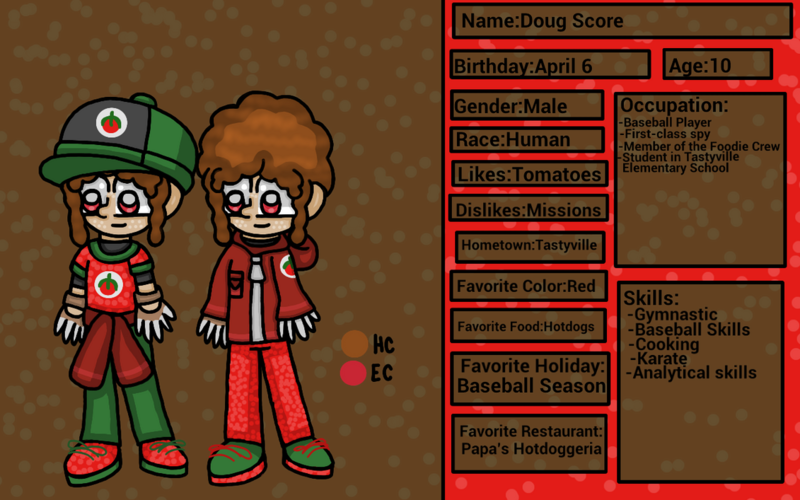 Doug rather be a normal kid ever-since he met Greg and got the love of baseball in the first place. Thanks to that, he got himself love baseballs and tomatoes. He hopes one day he retired and have a normal life. -He knows many foreign languages. -His birthday is the day Fresh Tomato Day celebrated. -His favorite baseball team is the Tastyville Tomatoes. 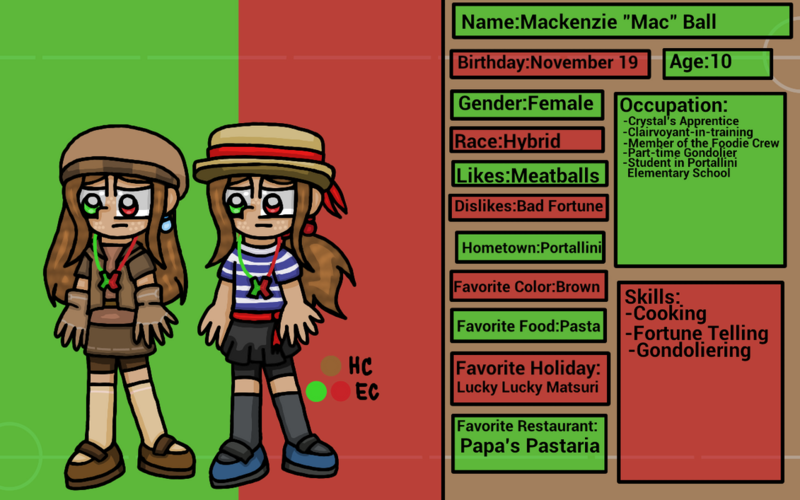 Mackenzie or most people called her Mac, is the granddaughter of Crystal. Like her grandmother, she's a fortune teller who predicts every possible future and luck but sometimes she afraid of telling bad fortunes. She's so shy that she got bullied many times, mostly because she's a hybrid from her mother's side. But she always shows confidence when Deano is around which she has a huge crush on him, sometimes she's a yandere whenever a girl is around him. 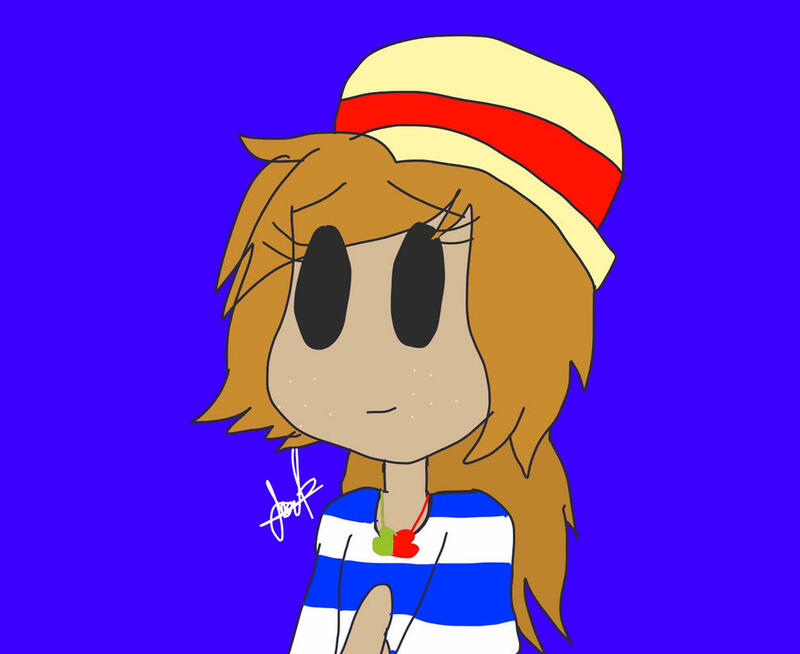 Thanks to him, she got a part-time job as a gondolier so she could be closer to Deano. -She suffers on what she want to be in the future...either Gondolier or Fortune Teller. -Her necklace came from her mother. -Her favorite type of pasta are Mac N' Cheese. His mother abandoned him as a baby and left him to the front doors of an amusement park. There a man saw him and decided to raise him as his own. The man discovered Choco being a genius and his IQ is higher, which many people recognize his talent that got him a scholarship to Eclair Academy on very young age. He started and graduated in the age of 4, and helps his father's amusement park. But at the age of 8, his father was missing and fearing on going to the orphanage...he decided to run the amusement in secret with the help of his AI son, Jimmy. With the help of the Foodie Crew, he would find his father and his problems. -He and Jimmy share the same birthday. -He is the only Foodie Crew member who didn't went to school due to being graduated. 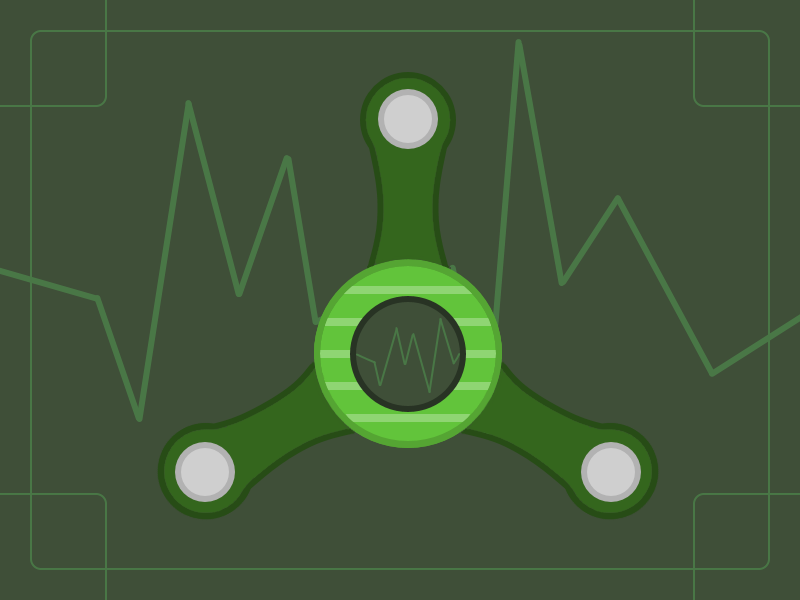 -He sometimes dislikes Benjamin for breaking his inventions and many more, which is why he was banned at his warehouse. -He hopes one day to drive a car. 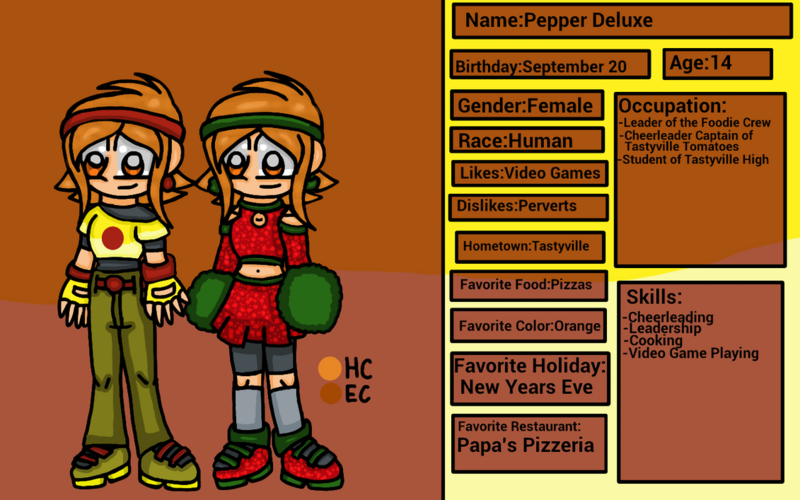 Like most family, she grew up with her mom and dad in a normal apartment in above Papa's Pizzeria. Before she became a cheerleader, she was once introverted little girl that focuses on video games then other things until she meant a cheesy someone who isn't from here. They became friends and realized that she is a cheerleader, despite missing her long time friend...she decided to become a cheerleader to remember her memories. Thanks to that, she became cheerful and extroverted that made her captain of the cheerleader team. -She has issues with secrets due to many people telling their secret to her. -Her birthday is the day Pepperoni Pizza day is celebrated. -She has many love admirers but refuse to be in a date. -She always wanted a younger sibling, but her mother is unable to gain anymore pregnancy. So she sees the Foodie Crew as siblings. When he was kid, he used to be a big bully to the kids his age and once live in Oniontown with his parents. But when his parents were divorced, he and his mother moved to her childhood town and live there. While unpacking, he meant a a strange "dog" and decided to keep as a pet. He grew to becoming nicer and but way competitive. He even started to take soccer in Alberto's team. Despite that, he secretly wanted to be a famous actor since he watch many amazing movies and fan of it. He did got many minor roles and was starred in many movies, but no knows but the Foodie Crew. -His birthday is the day Onion day celebrated. -His allergic to cats, explaining his hatred on cats. Which is why he and Cala Mares don't go along with them. -His cousin with Sarge Fan. -He doesn't know what happened to his father. She's the little sister of Willow, and she's a goth like her. Unlike Willow, she's not really shy and loves to create trouble by manipulative everyone for her bidding. 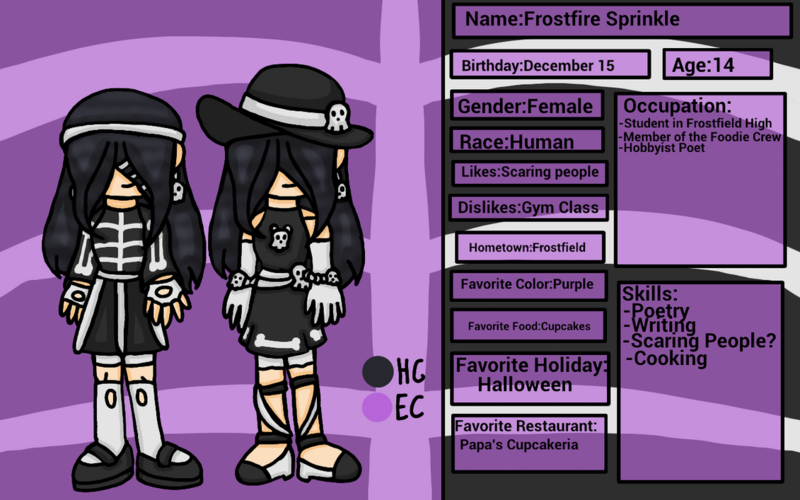 Most people are afraid of her due to her scary appearance and rumors, which is why she has less friends. Luckily, she has a Grimm who is her boyfriend, a long time onion ghost friend named Whisper, and her foodie crew members on her side. She can be act like a sister from drinking tea or writing some exciting poems who dreams on becoming a poet. No one dares to see her eyes because it's called a "Ghost eyes" for some reason. -Her birthday is the day National Cupcake day celebrated. -The only time she shown her eyes is when Halloween came or when she wants to scare someone. -Her favorite monsters are skeletons because it's real. Grimm isn't his real name, but Marshal Thoremerald. He was originally gonna be next the head of the clan but was kicked due to being sneaking out numerous times. He now lives with his grandmother in a small farm and tends to help the farm for their needs. Despite being peaceful right now, he has angry issues and tends to hurt someone that badly. But he manage to calm by his girlfriend, Frostfire. He tries his best to stay calm and make sure his fellow friends are acting sane (Especially to Benjamin and Onion). -His birthday is the day Grilled Cheese Day came. -He secretly have a gun in him. -He got his scar from his father during their last fight. Cala Mares Shuichi was born in a family of traditional dancers where the girls in the family are tradition to dance like her family. But Cala Mares was blinded by the love of anime that she dream on becoming a animator instead of a traditional dancer. Her parents accept her wishes but her grandmother didn't and she tries her best to change her mind. She works at her father's noodle shop as a waitress after school. One day, while working...she met up with the male foodie crews who are eating noodles and started to have good conversation. The male foodie crews decided to take Cala Mares to Oniontown to meet up with the female foodie crews and Chippers Nut who the female foodie crew met up with him. Few minutes later, Jester X Game came and made another challenge, luckily they won which lead to Cala Mares Shuichi and Chippers Nut the new members. 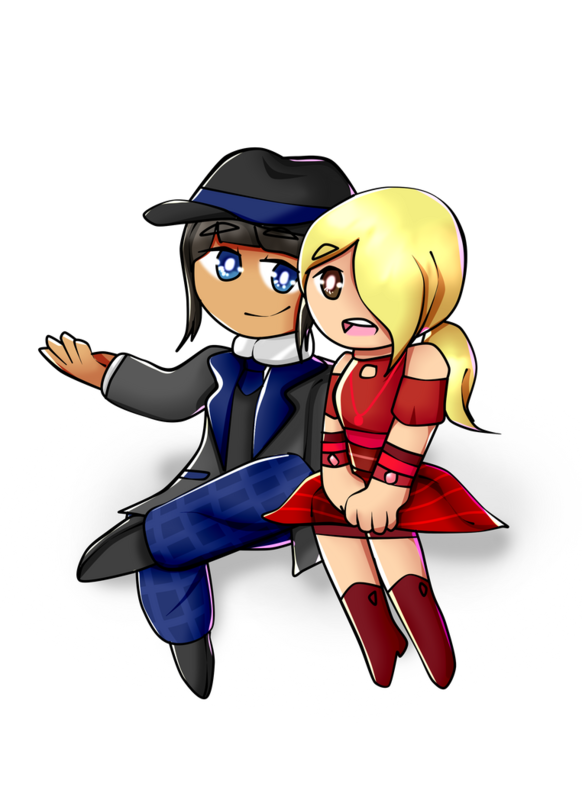 -She has her own YouTube channel filled with animations, game review, and many more. -She's good friends with Tohru. -She won a cosplay contest 3 times. 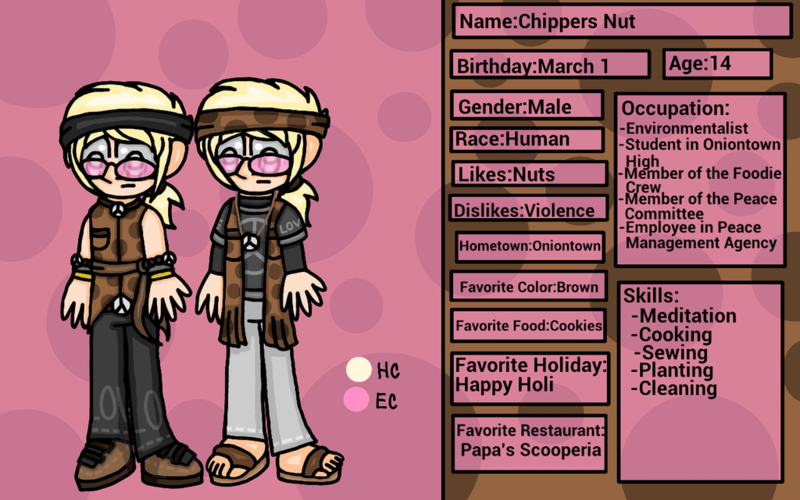 Chippers Nut was born and grew up in Oniontown with his single mother. 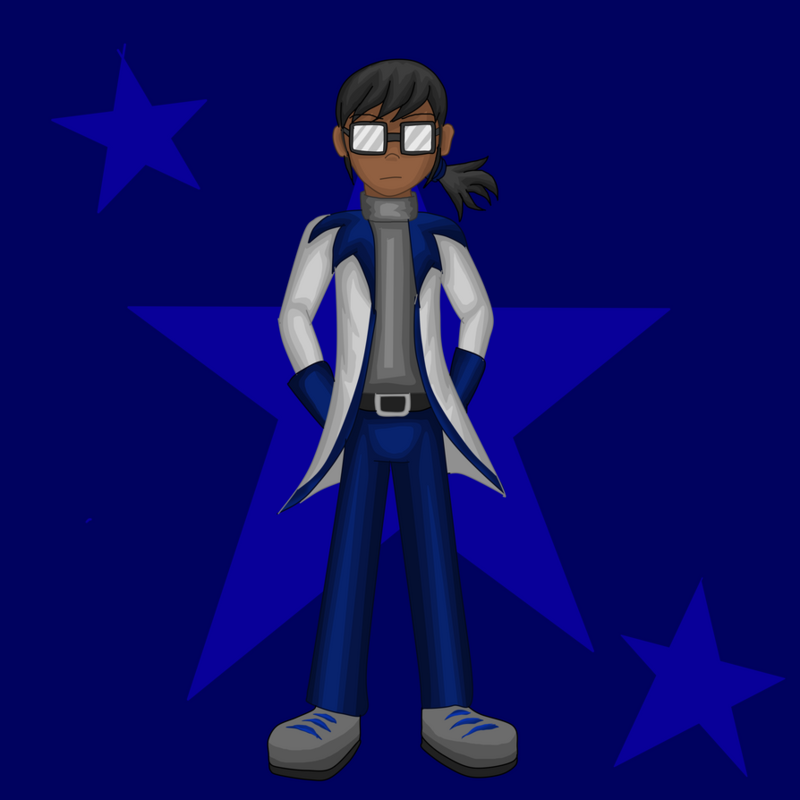 His mother is the guidance counselor in Oniontown High and manager in the Peace Management Agency, and he was taught to show peace and patience to everyone including the bullies. He volunteers every community for mother earth. He works at Peace Management Agency after-school. One day, he met up with the female foodie crews who signed up for meditation. 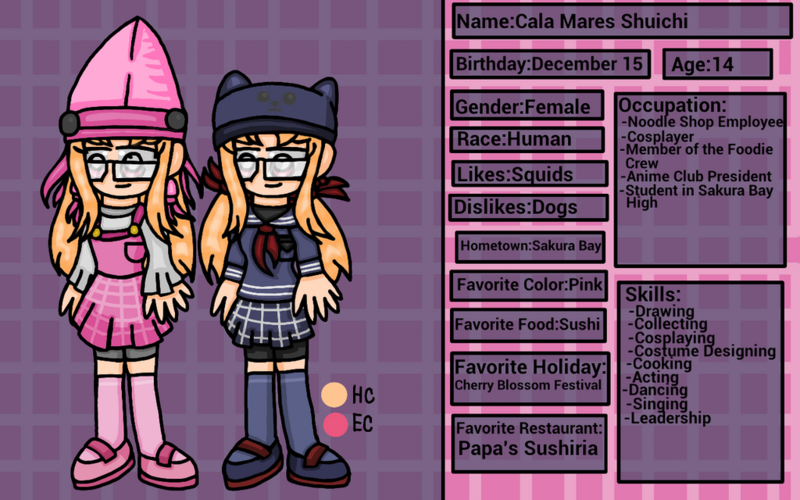 They have a nice conversation which later met up with the male foodie crews and Cala Maria Shuichi who they met up. He almost met up with Onion who is his half-brother and bully from childhood. Onion apologize to Chippers and he forgives Onion from his bad deeds. Later, Jester X Game came and create a challenge. Few minutes later, they won and which made Chippers Nut and Cala Mares Shuichi the newest members. -His birthday is the day Happy Holi was introduce in Flipline. -He forgives every bad guys. -He sometimes acts like a therapist to the group. She's the richest member of the Foodie Crew and also the mother-like of the group. She has a passion of being a chef but her mean mother didn't want that since she wanted her to become a singer like her, which started their abusive relationship until her father divorce her. Her father remarried many years later with her step-mother being Thea along with her daughter. She and her step-mom have a great relationship due to her being a chef and she hopes one day to be own her step-mom's restaurant. Out of all the members, she's the best cook and acts motherly to them. She also have a love of Brussel Lark that she even donate some money for charity and dressing up like them. 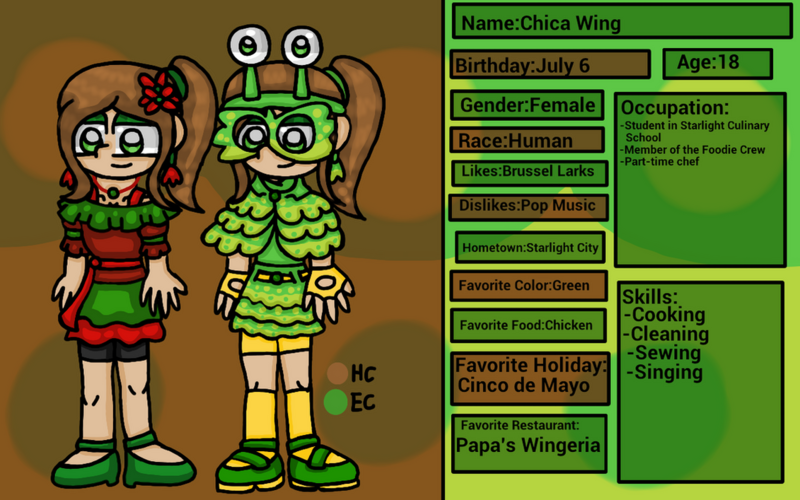 -Her birthday is the day that chicken day celebrated. -She let the Foodie Crew come to her summer mansion as their own home base. -She sometimes sing only to her Mexican culture and christmas. 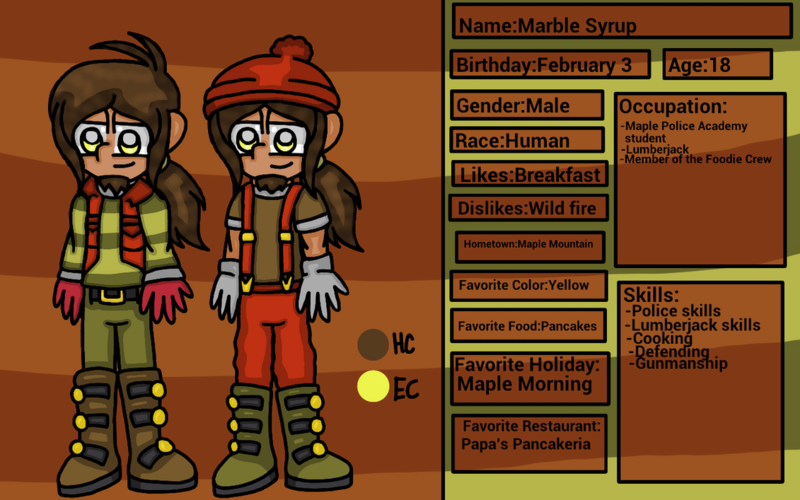 Marble grew up in Maple Mountain with his step-father Johnny, his half-brother Woody, and his mother. Like Johnny, he is a lumberjack and do well in the business. He always wake up in the morning to go to his favorite restaurant, Papa's Pancakeria. Even though he like his job, he prefer to be police officer ever since he first met Hank who is also his mentor during the his father was arrested.. Whenever he doesn't do any of those jobs, he sometimes camp out with Woody, play his guitar, or hang-out with the Foodie Crew members. -He and Chica sometimes do a Christmas carol. -Coincidentally, he loves maple syrup. -He is the father of the group. Blueberry Pi grew up in Whiskview. She used to be bullied when she was a kid but she is now the friendly person to everyone she met. She dream on becoming a mathematician just like her late parents. She won many awards from every math competition she competed, and one of the competition got herself a full scholarship. She always pay a visit to her favorite restaurant, Papa's Bakeria. -Her birthday is the day when Pi day is celebrated. -She was born with blue hair. -Her aunt gave her the name Blueberry. 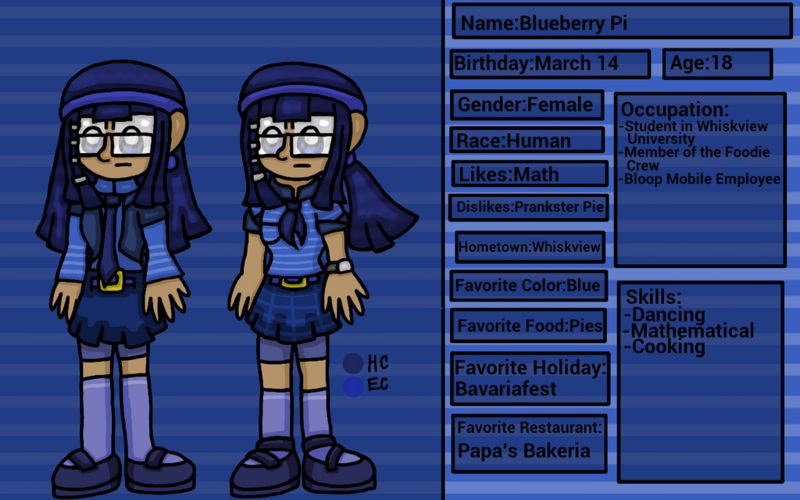 She is the split personality of Blueberry Pi. 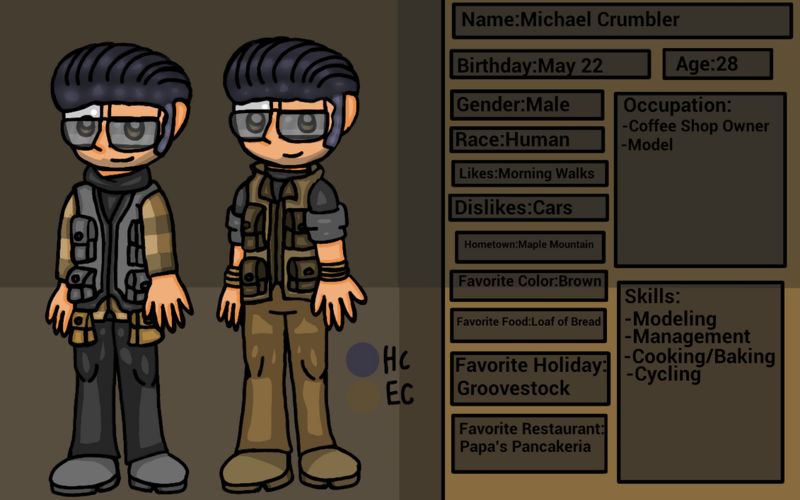 A infamous crazy lunatic who pranks everyone, cause mischief, and starts the pie fight. 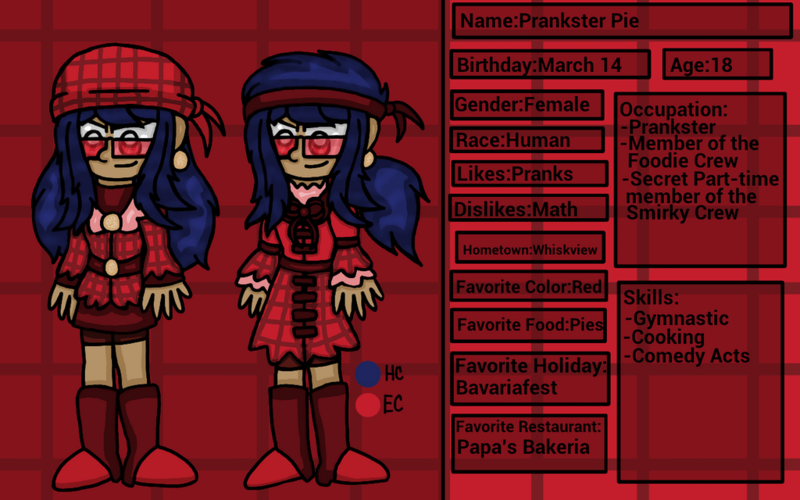 It's unknown who Prankster Pie, but no one knows but her friends that Prankster Pie is Blueberry Pi. Blueberry got her DID by having nightmares about her parent's death, fear of the dark and many more, and being hungry for few days. 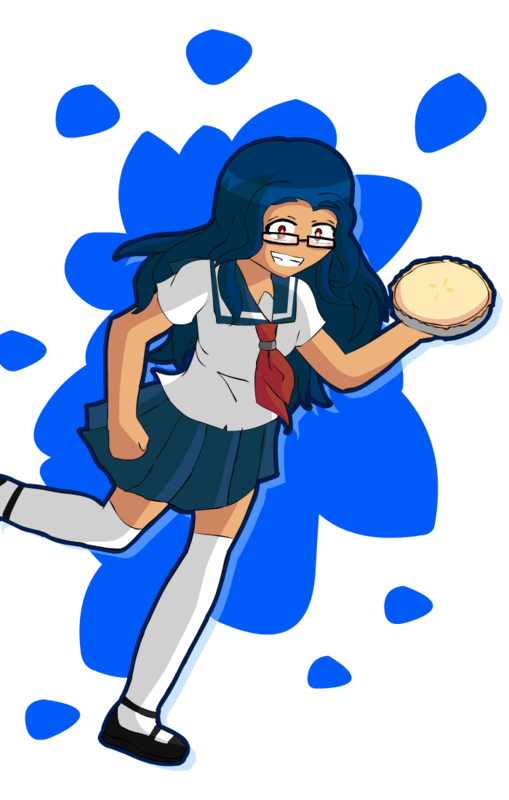 She started her first pie fight when she was 8, which Blueberry Pi doesn't know that time till' she was surrounded by pies few months later. 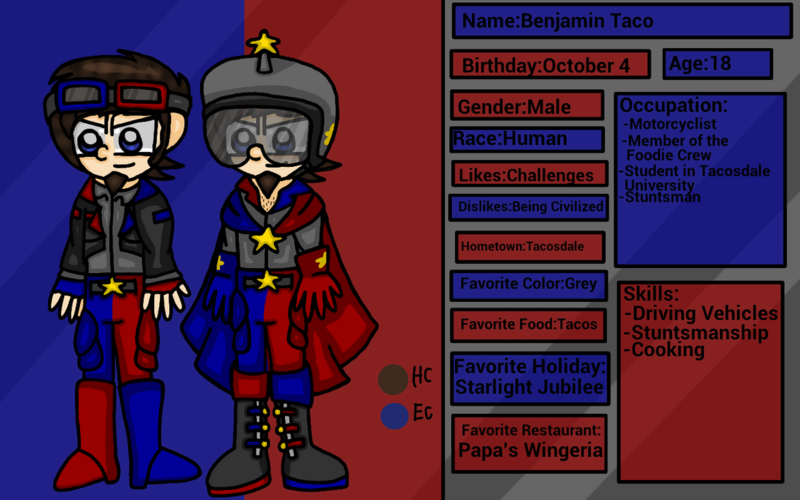 She's also has a crazy massive crush on Benjamin Taco. Right now, the identity of Prankster Pie is unknown. -She used fruit pies instead of meat pies like Guy's pies who Prankster hates. 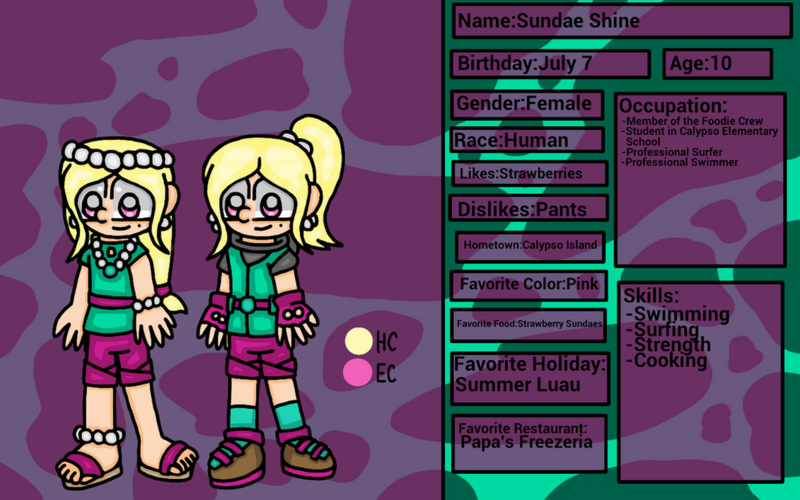 -The reason she's a secret part-time member of Smirky Crew is because she was blackmailed. Blueberry Pi doesn't know about this. 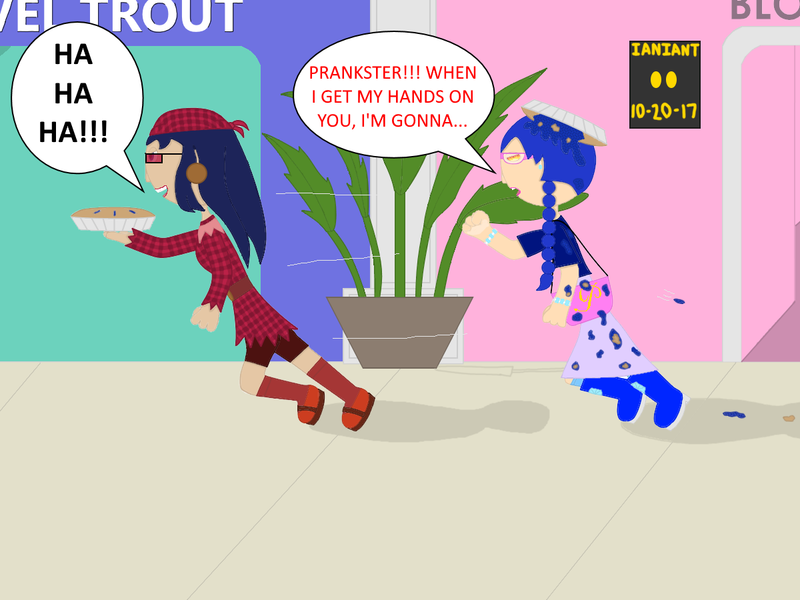 -Blueberry Pi can be switched to Prankster Pi by sneezing, fainting, or electrocuted. Benjamin is the son of Jojo, the Food critic but he is nothing like him. He is a stunts-man who likes doing extreme with his car and motorcycle. But sometimes his stunts goes wrong and ended up in juvie for a week or so. He was once a mature kid but ever since his mother died, he started to distance himself from others that is until he saw Boomer's shows and got him admired to do stunts. He grew up being less mature and a troublemaker but despite that, he is really protective to others. He sometimes hangout with Akari and Rico to do some motorcycle ride or his time with the foodie crew members. -He broke Choco's car numerous times, which ended up paying the damages. -He is also banned from going inside Choco's lab. -He has numerous criminal records. -He has a crush on Blueberry since their time in camp during their summer break as kids. -He is sometimes get more mature when Prankster Pie is here (Due to PP being more insane than Benjamin). When he was a baby, he was abandoned by his parents and was dropped infront of the orphanage. He lives a sad life in the orphanage and no one play with him till' he got adopted in the age of 8. Eventhough he was happy with his new family, he always get bullied in school. There parents saw his injury and healed him up since his parents are doctors. He admired his parents doing that he decided to learn about health and become a doctor. But seen his too young to be a doctor, he decided to be a nurse when the time is right. He decided to go back to the orphanage to take care of children seince they reminded of him before getting adopted. When he heard Radley creating havoc around Munchmore, he decided to stop him with his new friends and form to group called the Munchmore Freedom Gang. 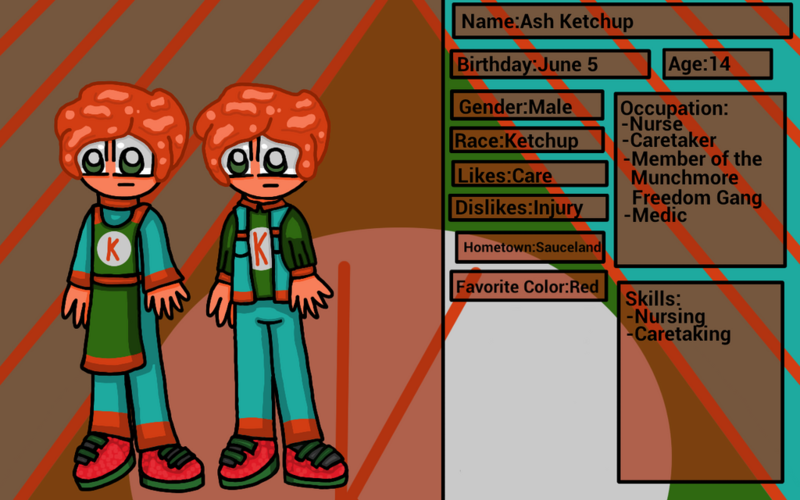 His birthday is the day when Ketchup day is celebrated. 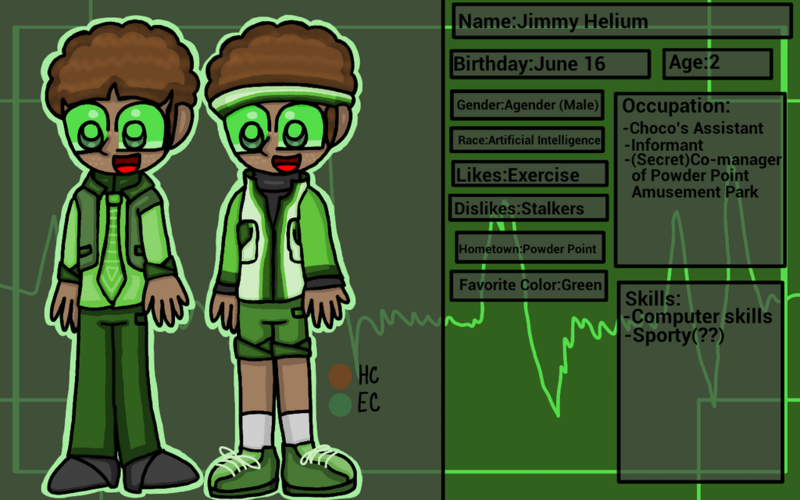 Jimmy was created by his creator and "father", Choco Helium. He was programmed to be a informant who gather informations in the amusement park and surveillance. He is also programmed to have a positive attitude. He always around Choco from his phone to the computer. Whenever he is not doing something, he always hangout with his master and his friends. He sometimes do some exercise eventhough he is a Artificial Intelligence. 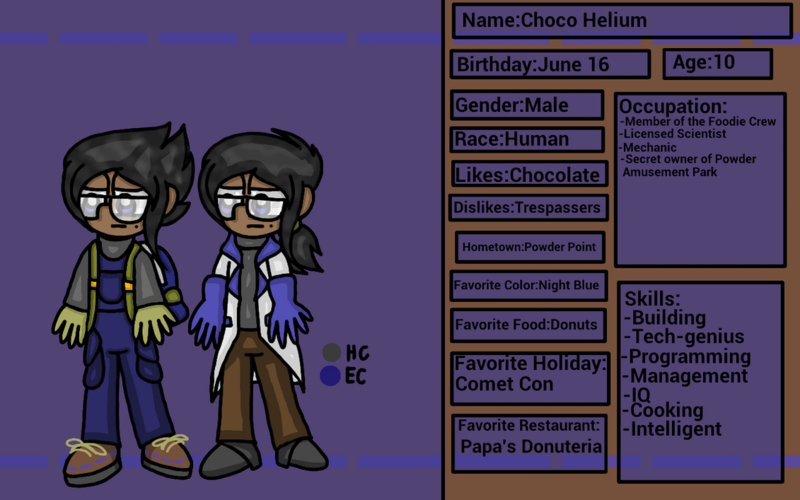 He and Choco have the same birthday. 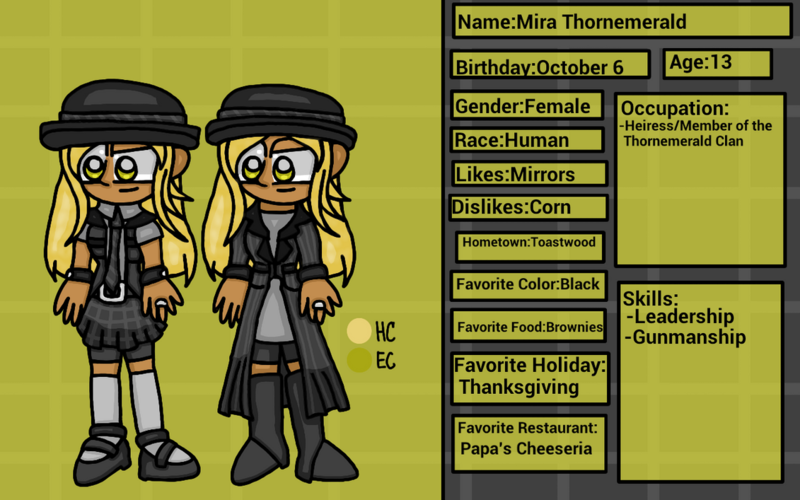 Mira is secretly the second child of the leader of the Thornemerald Clan. 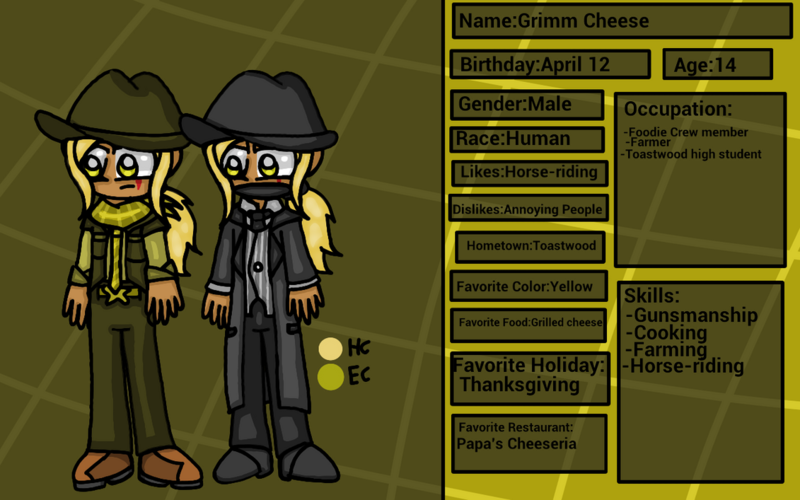 She wasn't originally a heiress until her father kicked her older brother Marshal (Fake Name: Grimm Cheese) for leaving the house numerous times without permission. Thanks to that, she became the heiress. She's a spoiled brat that she tells her servants to do what every she wants, that made her know her duties as future leader. Whenever she leaves her mansion, she always accompany by her bodyguard and cousin Cora. -Her birthday is the day "Cactus McCoy 2" was released". -She has a huge obsessions on mirrors. Despite everyone loving her fashionable clothes she made, she's actually a biggest jerk of all. She doesn't care about everyone including her little brother Doug. She always criticize people and make sure they improve very well. The reason she was always like is when her father was murdered by an unknown stranger that Doug invited at age of 10. She blame him for the murder despite him being a young boy that time and they started hating eachother. 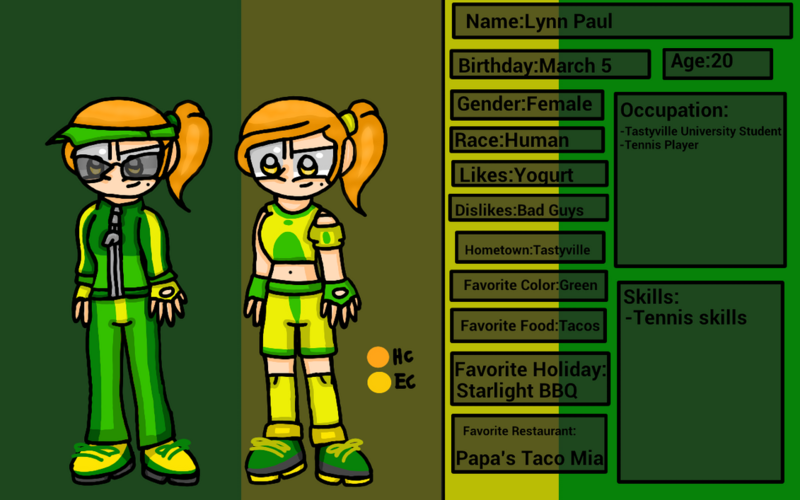 She and her brother are first-class agent and partners to gathered info about Papa Louie's customers due to them being threat (Thanks to that Food Attacks). She's also the master of disguise with her being unknown if she really is her or not. -She uses their secrets to take advantages. -She's the next head of her spy organization. 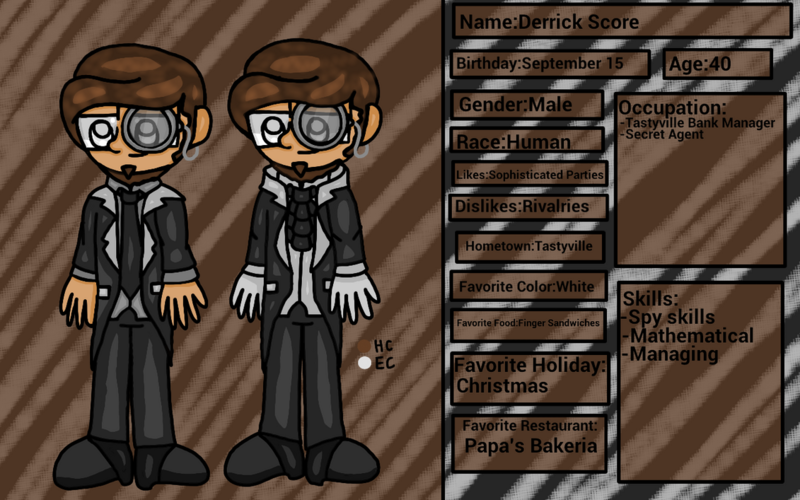 He is the uncle of Penelope and Doug, as well as the younger brother of the late father of those two. Like his niece and nephew, he is a spy who's mission is stopping some money heist. Which is why he is the bank manager of Tastyville. Many ladies has a crush on him, which made him being invited to sophisticated parties. While not doing those, he goes home with his niece and nephew. He was so close to them since they see him like their late father, but Derrick has trouble taking care of the two from fighting. -He is one of the entries of mine in KCP 2017. -He knows Flynn and had a rivarly ever since. -His fancy attires came from Penelope. 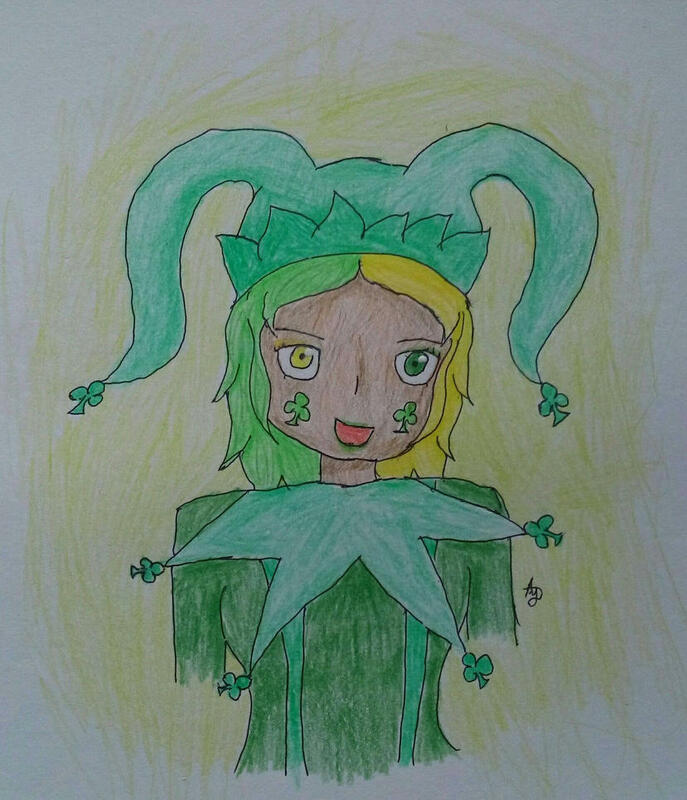 She is the daughter of Jester X Game and unlike her father, she is more sane and prefers being calm and understanding. She is really into solving problems and wanted to be a psychiatrist when she grows up. She went to school despite being different and tries to understand and solves their problems, which gain some popularity. She even met Woody and became good friends. Of course, she has to deal with her father and his fans every time they made a force challenge. She did help the participants from those challenges they were force. -Her birthday is the day Harley Quinn debuted. -She doesn't like using her powers since she thinks those are easy way to do it, and prefers the hard way. -She is the only X-Game who isn't bad. -She was curse by her father (The truth about the X-world and his past) and her future son, Spade (Who she knows the truth about he and his siblings). -Heart, Diamond, and Club doesn't know about the fact her mother knows they are related. 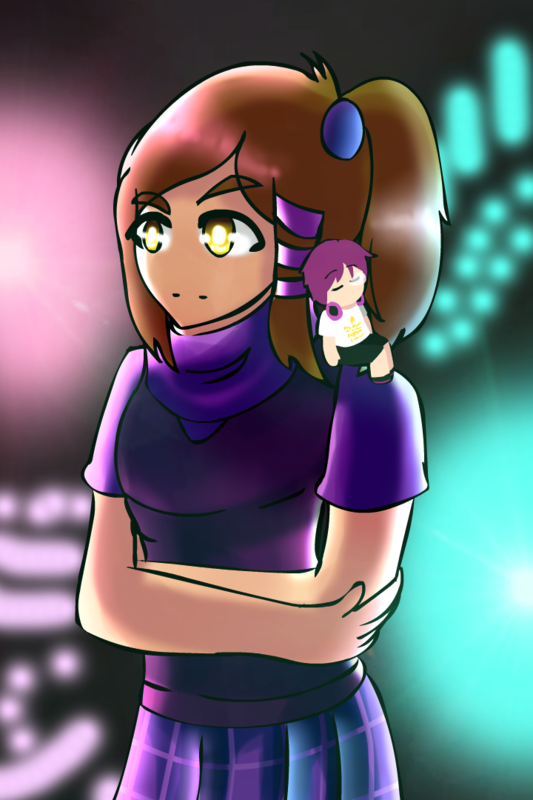 Club is the eldest grandchild of Jester X Game and the club of the group. She's a young girl from the future who time travel from the future to change the past of where their grandfather didn't got reform. She disguise herself as a human along with her siblings in the past to prevent from knowing. She is everyone's friend with her luck and kindness, but she is really naive to understand. She is really good at doing gymnastics and sometimes parkour that many people see her. She is really lucky like the time she passed the exam despite not really studying but sometimes clumsy which causes her trouble. She is really good at managing small business as a cookie scout and hopes one day to be a businesswoman. Either way, she's always the joy of the family. -She always accidentally burn down Papa's Pancakeria numerous times. -She's friends with Ianiant and sees her as a big brother. -She does heard and witness some specific activities like a secret but she's too naive to know. 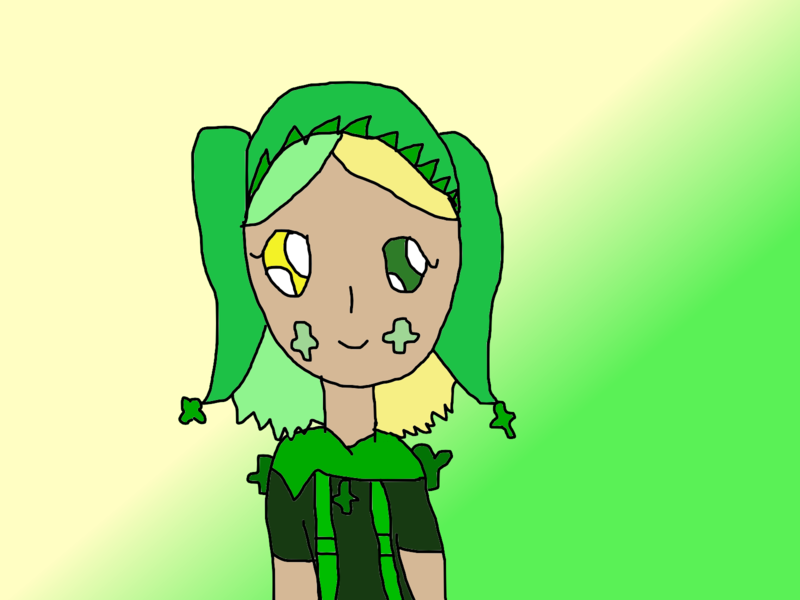 Club is the second grandchild of Jester X Game and the diamond of the group. He's a young boy from the future who time travel from the future to change the past of where their grandfather didn't got reform. He disguise herself as a human along with his siblings in the past to prevent from knowing. He is one strong child for his age and he always competitive when it comes to sports, challenges, or anything. He is has lack of intelligent which is how he failed at school. He always support and protects his family from danger, but sometimes create an argument mostly to his sister Heart. -He is quite knowledgeable on gems and secretly wanted to owns a jewelry store. -His favorite gem is obviously diamonds. 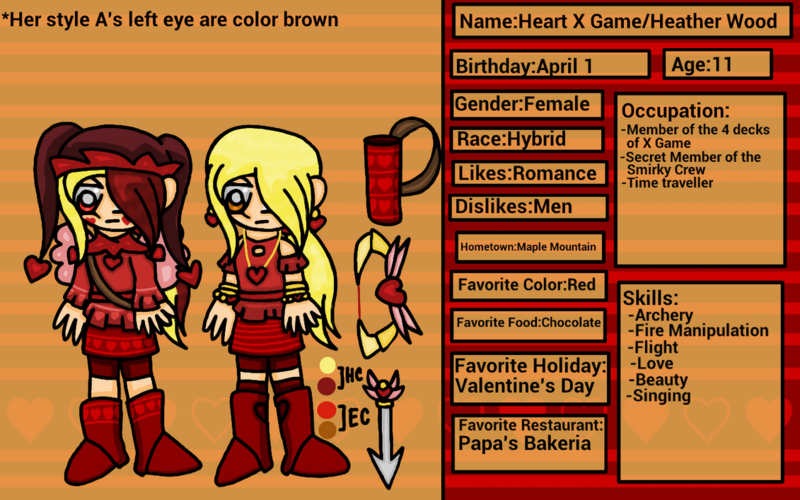 Heart is the third grandchild of Jester X Game and the heart of the group. She's a young girl from the future who time travel from the future to change the past of where their grandfather didn't got reform. She disguise herself as a human along with her siblings in the past to prevent from knowing. She has a interest on love and romances but ironically, she hates men. She started hating men due to a boy who used to be her crush used her for selfish reasons. Whenever a boy does something bad, she gave them a threat by fire or maybe use her bow and arrows. She deeply care about her family even if it is a man. -She has a secret crush on Mercury. -She won numerous archery competition she entered. -Many of the boys have a crush on her. She was born in a family of Traditional dancers along with her twin sister, Cala Mares. Unlike her sister, she follows her family tradition and proves that she worthy to become the head of her family which made her popular at school. 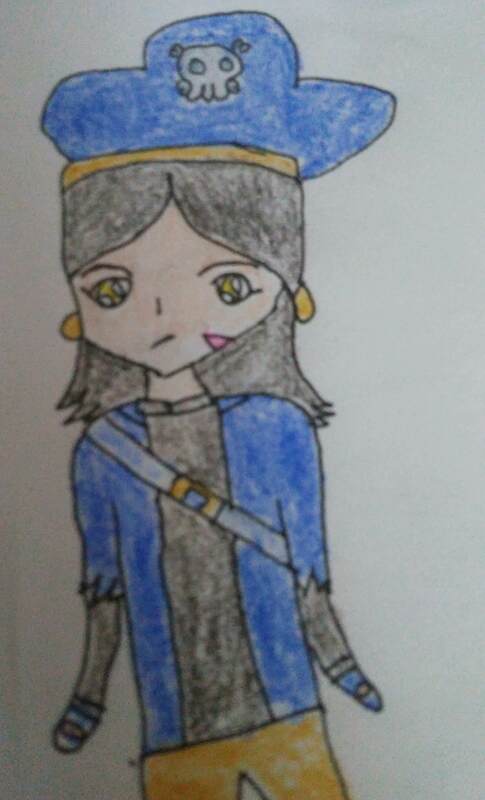 Despite being a graceful dancer, she's also selfish and a bully to her sister like she ruined her chance to accept at the same school as her, ruining her creative work, taking all the credit, and many more. -Aia means "One who is famous, ruler of the house"
-She always takes every guy from her sister to herself. -She doesn't worked at her father's noodle shop unlike Cala Mares. 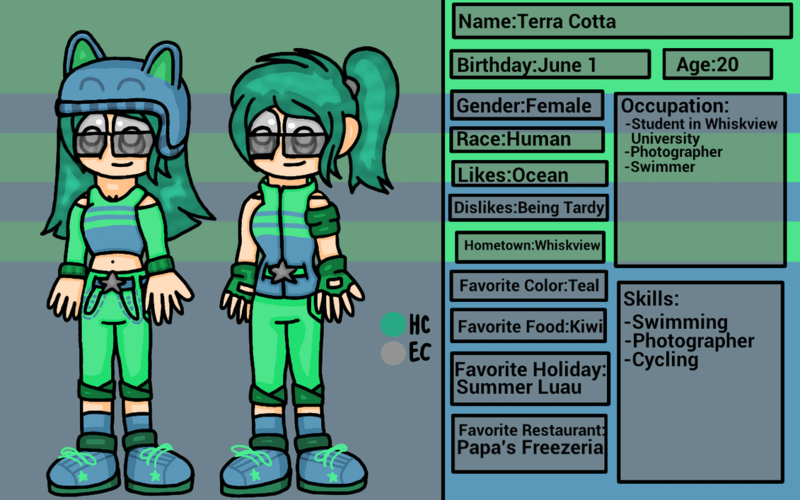 Terra grew up in Calypso Island but moved to Whiskview to study in Whiskview University to become a successful oceanographer. She has been interested on learning the ocean ever since she was kid when she and her younger brother enjoys a fun day in the beach. Whenever school is over, she sometimes hangout with her roommate Dee or maybe enjoys her time exercising in Fitz Frenzy Gym. -She is one of the entries of mine in KCP 2017. -She loves cats so much that she hopes to have more than 4 cats. 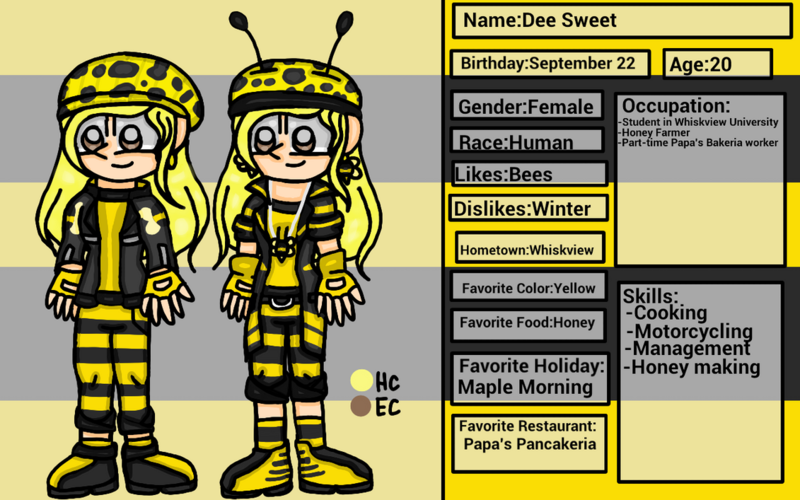 She's a young college student where she was originally from Maple Mountain, where she and her grandma owns a bee farm to gain some honey. She always took care of the honeys for a long time that she hopes to run her grandma's business when she's older. 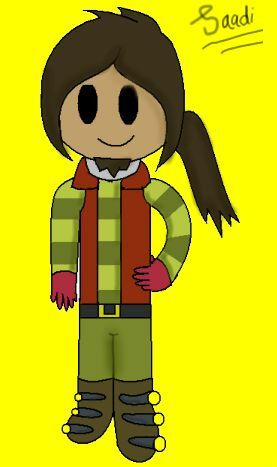 She moved to Whiskview to study in college for her management in the bee farm, where she meant Terra her roommate. When not doing those, she sometimes go around riding her motorcycle. -She has similarities to her creator...first name and birthday. -She is one of the KCP 2017 entries. 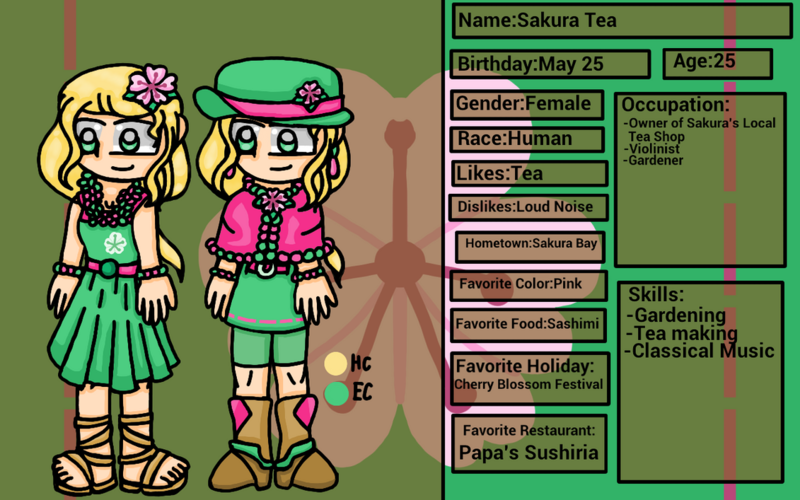 Sakura owns a small local tea shop in Sakura Bay, where she fascinated on having a peaceful mind. Many of her customers love her tea especially her best customer, Cala Mares. She skills with the violin since her time as child and used to create a harmonious tune. Whenever she's not doing those, she sometimes went to the nearest waterfall and have a small picnic. 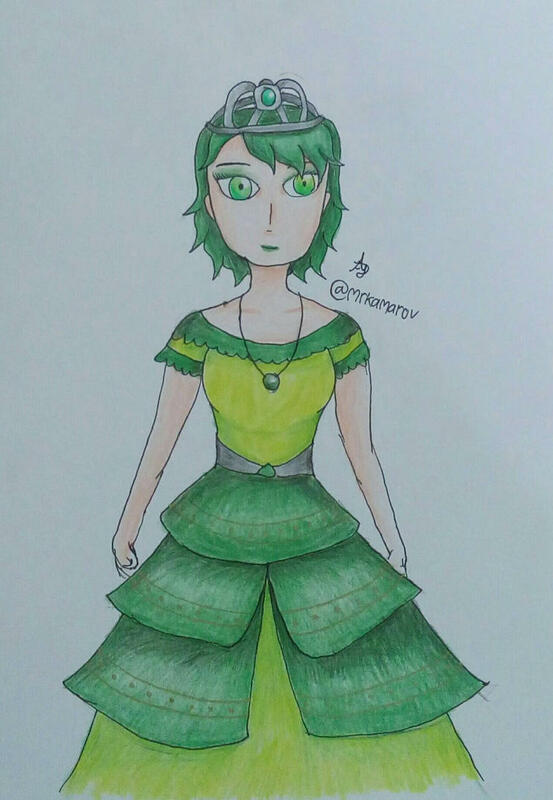 -She is one of the KCP 2018 entries. -When she was kid, she entered a talent show and won for fascinating violin performance. -Her favorite flowers are chrysanthemum. He is one ordinary coffee shop owner from Maple Mountain who is also a model for some magazines, which got girls to fall for him. He is such a gentleman to the girls, but he has girlfriend named Lynn who they both love eachother. He likes to walk around the morning of Maple Mountain and enjoys the breeze. He can also enjoy some hiking, camping, or hanging out with people like Woody and Marble. -He has a fear of cars due to an accident. -Thanks to his fear of cars, he wouldn't go to any vehicle and prefers riding a bike. She came from a family of Tennis players, so has some skills. She won many games she competed, which many people admired her. But sometimes get in trouble like the time she hurt someone thinking that person is a thief. Cala Mares Shuichi and Chippers Nut is here!! Thoughts about the new characters? Chippers looks like a hippie. I love them! Cala Mares is so cute! Well i wanted him to be based on Happy Holi. Never noticed that. I actually based on Kaede's school uniform.